I always take a stack of food magazines with me when I travel. By the time my vacation rolls around I'm almost always behind in my reading...but even if I weren't, cooking magazines provide the perfect amount of activity when I know there will be many short—or long—moments of down time ahead of me. If I am somewhere that offers me the opportunity to cook, they also provide instant inspiration. Almost without fail I return home with a dog-eared and post-it note tagged stack...and loads of new ideas. 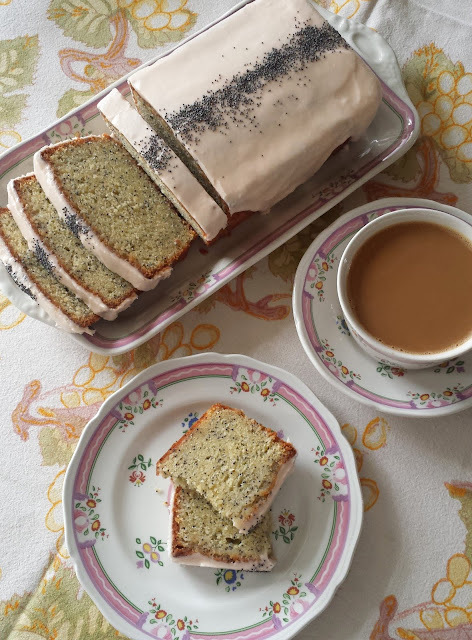 Because some of the best meals of my life have been at the table of my friend Bonnie...and her table is imbued with the food traditions of Sweden and Denmark...I always stop and take a closer look at articles about Scandinavian food. In the June issue of Food & Wine this year there was a travel article (with recipes, of course) about Stockholm. 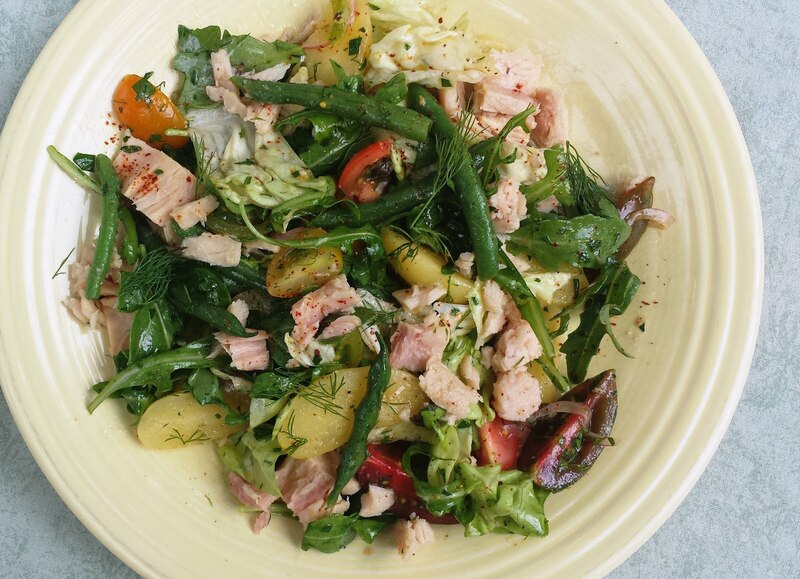 A recipe for a substantial salad of vegetables topped with flaked hot smoked salmon particularly caught my eye. It popped into my mind as I was considering what to make for dinner at the end of my first full day back home. The components of my salad were similar...but not identical... to the original. I didn't have any hot smoked salmon...but I did have some nice canned, olive oil packed tuna (from Trader Joe's...not the bank breaking stuff from Dean &DeLuca). 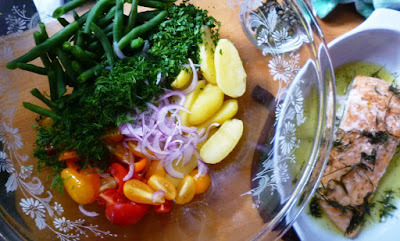 I added some poached fingerling potatoes to the green beans and cherry tomatoes called for in the original. And I used a mix of arugula and butter lettuce for my greens. The recipe in the magazine used a mix of red and green Bibb...and also included a few shaved radishes. I thought the peppery arugula would add the right note in place of those radishes...and it did. The thing about the Food & Wine salad that seemed the most unusual—and made me stop longer for an even closer look—was the fried caper vinaigrette. I love fried capers...and I loved the idea of using the oil used to fry them as part of the vinaigrette. The vinaigrette in the recipe was a bit more acidic than the vinaigrettes I usually favor...but with the potatoes and fish and soft butter lettuce, it was just the thing. 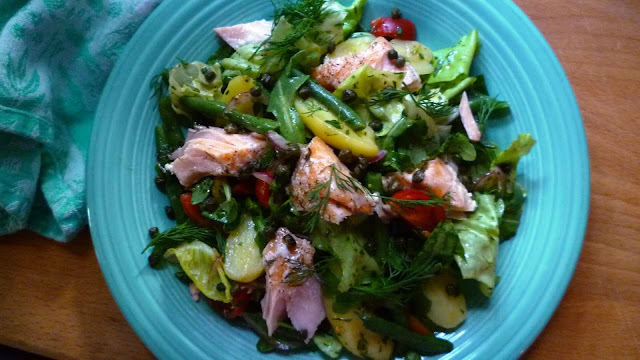 We liked the salad so much that I made it again a few days later....this time with slow-roasted salmon. And it was this version that I really preferred. The tuna was good...and I would make it again...but the salmon version was outstanding. If you have never slow roasted salmon, check out my post from a few years ago. It is so easy. It's a perfect method for salmon destined for a salad....and a perfect way to prepare fish in the summer when you don't want to heat up your kitchen with a super hot oven. I returned from my summer vacation well rested...and so inspired from my rambles through my reading material. I'm sure I will never get around to making all the things that caught my eye. But I hope that they will at least continue to percolate around in my mind and manifest themselves in my cooking—and here on my blog—during the months to come and until my next opportunity to get away to relax and recharge. Place the salmon in an oiled baking dish (skin side down) and season with salt and pepper. If you like, scatter a few sprigs of dill over the salmon. Place in a 275° oven and bake until an instant read thermometer reads 120°—about 30 to 40 minutes. Remove and set aside until ready to serve the salad. While the salmon roasts, scrub the potatoes and place in a saucepan. Cover with cold water. Salt the water and bring to a simmer. Cover and simmer gently until tender to the tip of a knife—about 15 to 20 minutes. Drain. When cool enough to handle (but still warm), halve lengthwise. If the skins are tough, pull them off (if they are tough, this will be easily accomplished). Place the potatoes in a large bowl and drizzle with the cider or sherry vinegar and season with salt. Set aside. While the potatoes cook, rinse the onions under cold running water—or soak in a small bowl of ice water for five minutes and drain. Spread on a double thickness of paper towels and blot dry. Halve or quarter the cherry tomatoes (depending on their size). Leave them cut side up on the cutting board (or transfer to a plate) and season well with salt and pepper. Let sit while you are pulling together all of the ingredients. When ready to serve, add the beans, red onions, cherry tomatoes and herbs to the bowl with the potatoes. Season with salt & pepper and drizzle in about 2/3 of the vinaigrette. Toss to coat all the vegetables well. Add the greens, season and toss again. If the salad seems dry, add more of the vinaigrette. Mound the salad on a platter or individual serving plates. Flake the salmon into large chunks and arrange over the salad (discarding the skin if the salmon was cooked on the skin). 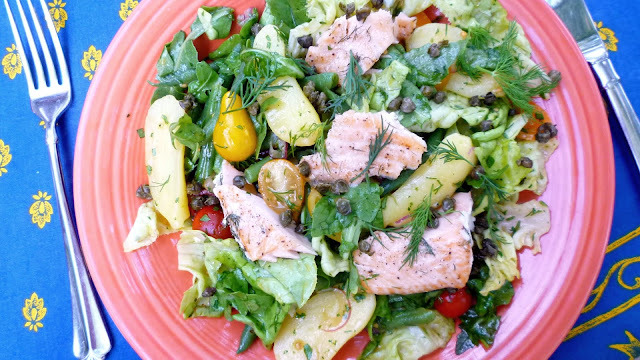 Scatter the capers and a few dill sprigs over the salad and serve. Serves 2 as an entrée. The recipe for the salad and vinaigrette are both easily multiplied to serve more. Replace the salmon with a 5 oz. can of olive oil packed, solid white tuna. Place 3 T. of olive oil in a small sauté or sauce pan and set over moderate heat. When the oil is warm, add the capers. They will begin to sizzle and pop as the oil continues to heat up. Allow them to sizzle until they open and begin to darken and crisp—about 2 to 3 minutes from when they first begin to actively sizzle. Strain the oil into a heat proof container and let cool. Spread the capers on some paper towels and set aside. Place the sherry vinegar, mustard and a couple of good pinches of salt in a small bowl. Whisk until smooth. Measure the cooled oil and add more olive oil to make 3 T. Add the oil to the vinegar-Dijon mixture in a thin stream while whisking constantly. Taste and correct the seasoning and balance with salt and pepper. Set aside.